Leading companies are adapting automation processes through technology everyday. After all, 78% of business leaders claim 360 hours could be saved per year through automation. And 90% claim it improves work quality and efficiency. Automation can offer new and innovative ways to both manage and measure today’s expanding independent workforce. By implementing a centralized, cloud-based system on a single platform, you have the ability to add many new efficiencies and functions, especially when managing your on-demand workers, freelancers, and contractors. Perhaps you have even started your digital transformation. But how can you ensure that you are prioritizing the most important opportunities? And which tasks can you automate to deliver faster work outcomes? Automated functions are critical to your enterprise, the growing on-demand worker movement, and your ability to compete. This is particularly true if your model depends on completing projects on-site, such as retail, IT/tech, and health care, to name a few. You will want to automate those processes that save you the most time and money, such as those detailed below. Here are 10 examples of on-site automation scenarios that are sure to help deliver faster work outcomes, in no particular order. You need a good contractor verification system that allows you to thoroughly vet independent workers, finding the best and most reliable contractors while avoiding surprise costs later. This vetting process can include screenings, drug tests, and background checks. Your system should automatically facilitate the process, verify the results, and produce the appropriate notifications. Many service organizations require their field techs to possess certifications, insurance, and licenses. By using a solution that automatically verifies this information, you can ensure compliance with legal and industry requirements and ensure that you deliver high quality service. The best systems automatically monitor for expirations and continuous checks on your contractors to make sure their qualifications remain up to date. How do you know that the contractors you hire have the right skill set for your business needs? Phone interviews and resumes alone do not necessarily tell the full story. We recommend a solution that includes a learning management system. This will allow you to create customized tests for skills assessment. You can validate the capabilities in minutes and then use a learning management system to help with the training and onboarding process. Need help recruiting top on-demand talent? Try these five smart strategies you can adapt right now. You're really losing out if your on-demand workers aren't able to check in and check out to respond to assignments. Contractors should be able to use a mobile app through a push notification to respond to assignments more quickly, upload on-site pictures, get e-signatures, and boost “one and done” rates. Check in and check out processes should include geo capture, time keeping, phone call check-ins, and integration with outside systems. Knowing the specific skill sets and work profiles of all on-demand workers makes leveraging large talent pools an easier and more simple process. Automated telephony features (like IVR and text) help increase first-time resolutions and overall customer satisfaction. When used before, during, and after work, a variety of customer rules or triggers can initiate actions and speed up your response times and overall communications. Your on-site operations organization should be able to easily order and track parts using APIs for FedEx, UPS, and USPS. Workers can track parts to align with work schedules and buyers can automate parts tracking with flexible rules, such as requiring the purchase and receipt of parts before the worker can check out. If your enterprise does volume service engagements, you will need to automate the upload of multiple data points such as projects, assignments, and locations. Save data entry time and ensure more accurate input by taking advantage of the bulk upload feature. Managing on-demand workers and freelancers at scale? Learn how a this new technology can arm you with powerful tools to track hundreds of freelancers across the country and collaborate with them in real-time. A full featured workforce management solution will automate how you find, manage, and pay your on-demad workers. An effective 1099 payment engine, like WorkMarket's, gives you the flexibility to pay your freelancers through an ACH deposit, credit card, or wire transfer. You can set terms at the outset of a project and send funds directly to workers upon your approval of job or task completion. The system will perform all calculations and allow for flexible rules such as bonuses or other exceptions, as well as integrate with your other payment systems. 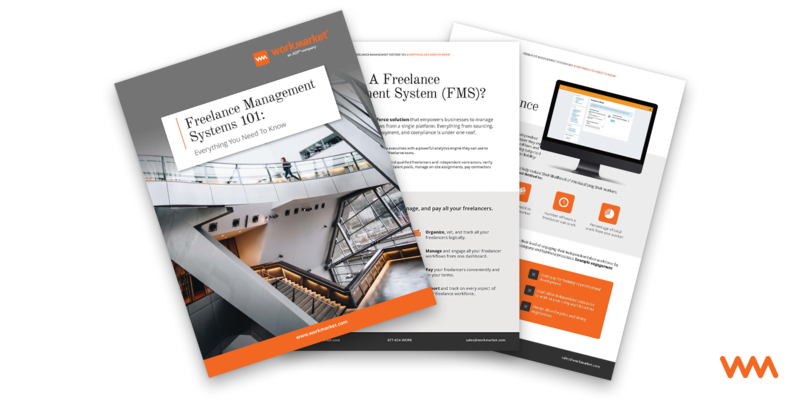 Your independent workforce management system will need to seamlessly operate within your existing infrastructure, including integration with other software systems such as NetSuite, Mulesoft, Salesforce or others. You should demand access to available APIs to push data into your workforce system, as well as receive updates back using various webhooks. The real benefits of automation are fully realized when multiple systems communicate with each other, combining data and providing a true enterprise view. Clearly the world of on-site work is changing. Businesses are preparing themselves with automation. Now, they just need a technology to organize and manage their talent.